Starting 12th, the DP squad carved their way through the field in the opening stints – taking advantage of incidents for the leaders to be right in contention after only a few hours into the race. Carl handed over to Adam who continued to produce a great pace with Alex and Nick keeping the car clean throughout the night allowing Carl to produce a storming pace in the last few hours to take the victory on the last lap of the race. Further success for the team also as the first GTE car entry finished 3rd in their class. A hard fought race by all 4 drivers meant they too were able to climb up through the field throughout the twenty four hours of racing. 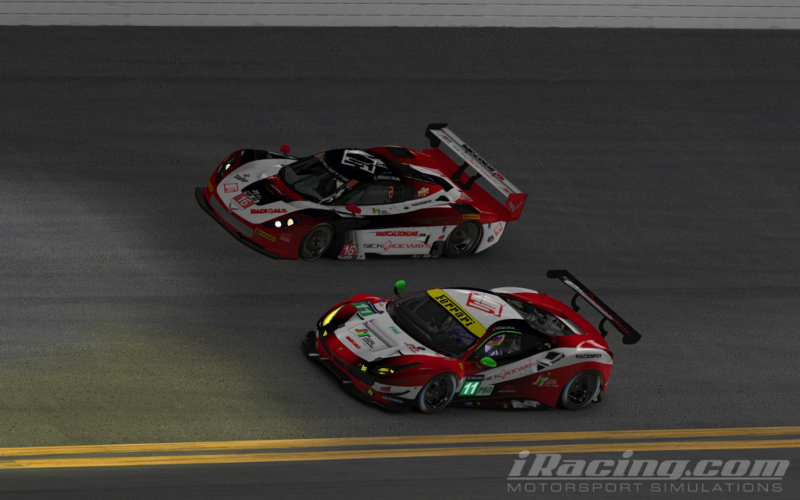 The second Radicals Online GTE entry just missed out on top split, but would have an eventful race in second split instead. Some bodywork modifications were made as the car scraped the pit exit wall at the opening lap which would be the start of a series of a missteps being made over the course of the 24h. After a further 2 spins with GT3 cars, a pit crew strike, a pit wall strength test, the first 9 hours of the race were completed with by power outage by one of the drivers. The race wasn’t looking great at that part being around 10th in class. But all 5 drivers, Ryan, Deni, Joeri, Joe and Paul kept their heads down and the remaining part of the race was much better. Despite being down on top speed they slowly moved up in the field gaining positions when other teams started running into issues. Some minor spins towards the end of the 24 hours didn’t impact the result anymore and the guys managed to finish in a solid 5th position.